Thanks for writing, Sherri. That’s a common question, which is why I like making these podcasts. 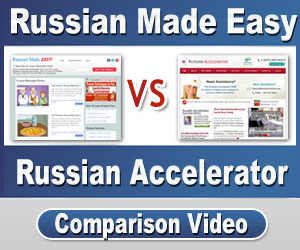 They’re a good introduction to Russian for those who are just getting started, but they’re also a great opportunity for me to expand on a lot of the main constructions you learn in Russian Accelerator. Case in point: Practicing with that “I need” construction. Did you hear that Ы sound at the end of the word this time? That’s their plural ending. The equivalent of our “s” in English. Like souvenir versus souvenirs. Think, for example, about the word for crepes. It has that Ы ending because it’s plural.. We’re saying pancakeS. The Mercedes S600 is my favorite машина. But in the U.S., the best selling машина is the Toyota Camry. So, a машина is a car. Alright…let those sink into the ever growing Russian language center in your brain and we’ll do some review of the last podcast now. Ask your friend: You speak English? My friend Pavel lives in Moscow. Мой друг Павел живёт в Москве. Марк, ты хорошо говоришь по-русски. So try saying, all in Russian, I need a bank. Now, I’ll give you one hundred imaginary rubles if you can tell me what all those words have in common. Hit pause and think about it. We need the feminine нужна to rhyme with the femine машина. Hi Matthew. Thanks for writing. That’s a very common question: Do I need to learn to read Russian? And the answer is, it depends. If all you plan on doing is speaking to people, and having conversations, then no, you don’t need to read. And you can definitely get around Russia or Ukraine on your knowledge of spoken Russian. You can order food, catch taxis, go shopping, and all that. But at some, it really is useful to know how to read Russian. Obviously all signs here are in Russian. But beyond that, learning to read allows you to then write in Russian, too. And to me, that’s the real advantage. Because, as I’ve mentioned, the physical act of writing helps you to learn more deeply. But you don’t need to learn to read right from the start. After all, think of how long you’d been speaking English as a child, before you ever learned to read. It was many years, actually. That’s why in Russian Accelerator, we make reading optional by writing everything with both Cyrillic — that is, the Russian alphabet — and with English letters, too. That being said, I do have a course that will teach you to read Russian in just a few days. I’m not kidding. Most members get through the course in about a weekend. And it uses the same very effective technique we’ve been using here to learn words…that is, context. And what’s cool is, the whole way, you’re learning to read real Russian street signs. It’s a really cool course. So if Cyrillic intimidates you, as you said Matthew, please go check it out. It’s called ‘Russian Destroyer’ and it comes free with Russian Accelerator. Let’s learn one more new cognate. Listen and repeat.. Here it is in context. Can you get the meaning? So, квартира is the Russian word for “apartment”…or a flat, I guess, if you’re British. Say: No, this isn’t my apartment. Нет. Это не моя квартира. Alright. Great job today. I hope you put all these on your flashcards. In the next episode, we’ll learn how to talk about the things we have, and ask other people what they have. I’ll see you then! 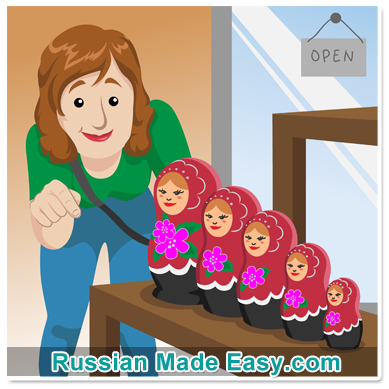 Learn Russian: Russian Made Easy 26 Привет! And welcome to episode 26 of Russian Made Easy. Как дела? Всё нормально? Could you please tell me ,What are the different between …Want & Need..When I Have to use …Я хочу…and when use Мне нужен ? Hi Mark, I was just wondering if you could explain to me the difference between “тебе” and “тебя”. I am still a little lost on the difference in their meanings, and when to use each, outside of the “I like/you like” construction. Thank-you. Dear mark, I’ve been learning Russian for a few months now, but I still don’t know what happens when “I need” is followed by a verb! What do I say whenever that happens? Is this example right: “ya nuzhno idti v banke.”?